In the year of “The Woman” please join the Genesis Theatre Company as we present a delightfully entertaining new show titled “O ZION-A Musical Tribute to Women in the Bible”. This original stage production showcases some of Indy’s finest talent with a gifted cast of 9 women as they tell the unique stories of 24 women from the bible through parodies in song and dance. Come and witness each character brought to “stage life” as you hear from: Eve, Sarah, Hagar, Jezebel, Delilah, the Witch of Endor and many many more! 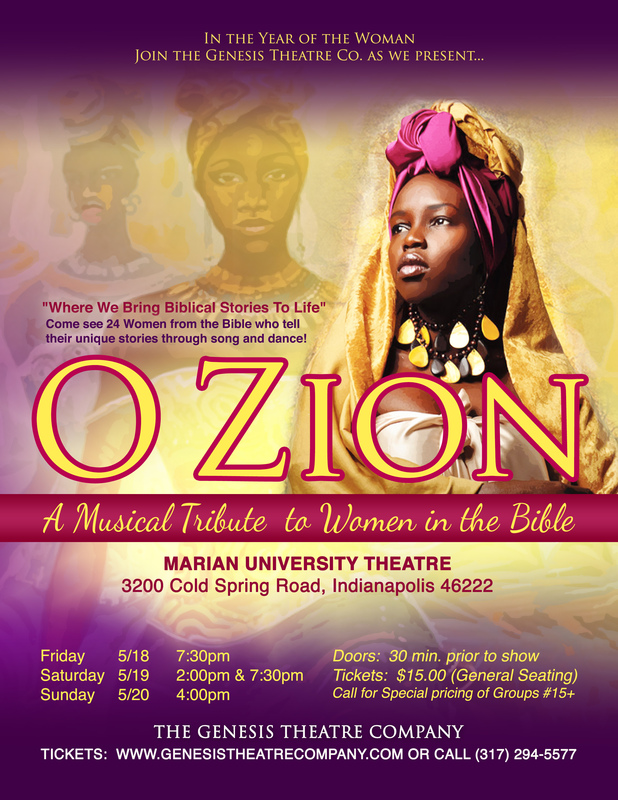 Don’t miss this dynamic moving stage play presentation of O ZION- A Musical Tribute to Women in the Bible. You’ll laugh, you’ll cry and be sure to sing along to some of your favorite show tunes and Hymnals, from Blues to Rock and Gospel. They’ll be talking about this one for years to come!